Things started off slow for the Skaven, as my long range fire was ineffective and I started out of range of the majority of my spells. 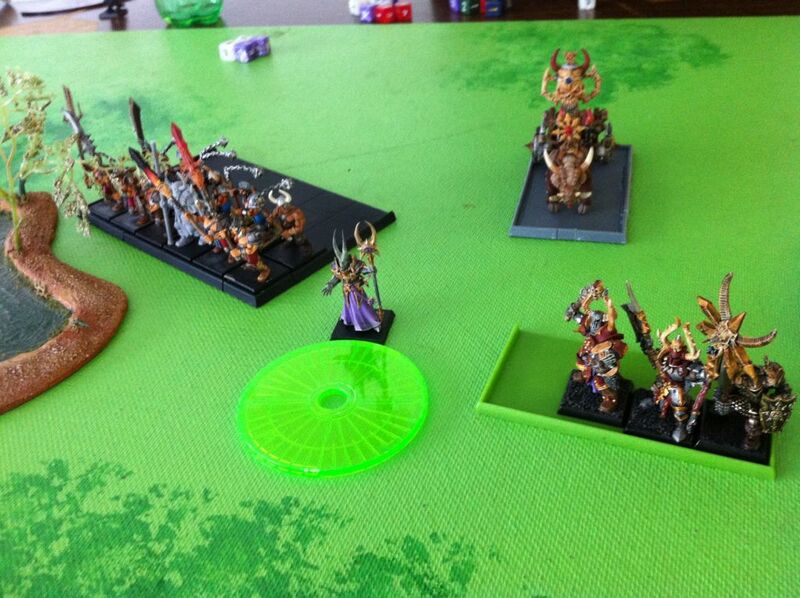 My opponent was able to chip away fast at my first Slave block as Treason of Tzeentch killed 16 Slaves fast. His Trolls marching forward a fast 12" immediately up the center made me redirect my attention to them fast. On the second turn the Skaven power wheel got going and I was able to do some serious damage. Starting off, I only had 3 power dice with the winds of magic showing a 2 and 1. I used my forbidden rod to get another 2 dice and had warpstone tokens to cause an imbalance in resources early. My opponent burned his dispel scroll immediately agaionst Plague, fearing the devastating rip through his lines. I was then able to use my powerscroll to drop 13th down to a required 14 to cast (GLWL rules puts 13th Spell up to 28 to cast) and I got it off without a hitch against the Chas Chosen, dropping them from 18 to 3 models! In the shooting phase, the Doomrocket gets a direct hit, crippling the Marauders on the left flank by killing 25 out of 35 models. 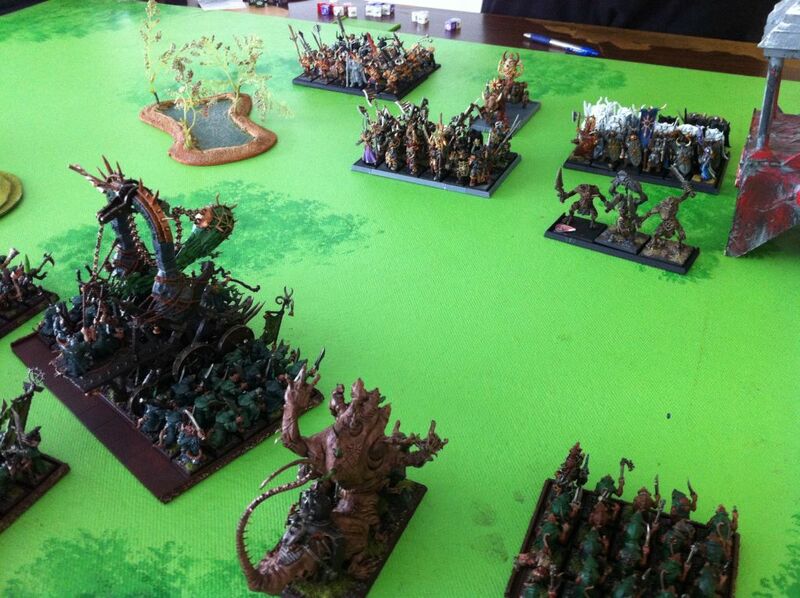 The Choas turn 2 begins with the Chaos Trolls charging my Hell Pit Abomination. I am slightly worried about the matchup, but the Trolls in front are now holding up the rest of the Chaos Warriors behind them with nowhere to maneuver. I burned my Scroll early in the game as well against a Purple Sun aimed for the Plague Furnace. Turn three, and I'm charging my Furnace into he remaining Chosen to finish them. Slaves joined the HPA in combat with the Trolls to add some static resolution (only 2 slaves in contact), and the Stormvermin charged to finish off the Marauders. Magic was fickle and I was only able to kill 4 Warriors with Plague. Combat was bloody, as the Marauders and Chosen were wiped out. The Chaos Trolls were taking no damage though, passing 6/6 regen saves. The furnace overran into the Chaos Warriors, which would turn out to be terrible as the Warriors now had a 2+ armor save with the Eye of the Gods roll from the Warshrine. 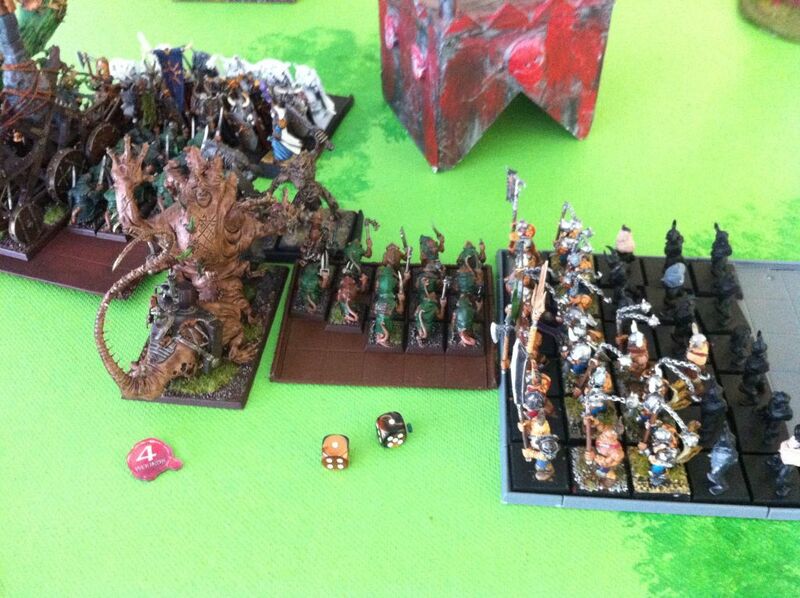 The Skaven Slaves get flanked by the Marauders next turn because I didn't expect the Trolls to be still around. This turn though I activate my Plague banner, and my Furnace and Monks kill the enemy Warshrine before the Furnace is taken out by the Chaos Lord on the next turn. The Warriors are able to gring down the Monks and cause them to flee, but do not catch them and are blocked by the still surviving Trolls from maneuvering, again! 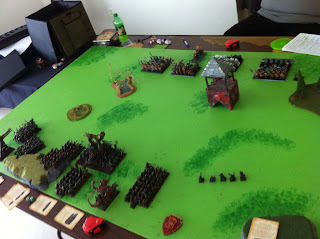 The miraculous Skave Slaves roll double 1's for Insane Courage TWO turns in a row to save the flank of my army, as I now decide to sit back and try to magic the remaining Warriors to death. 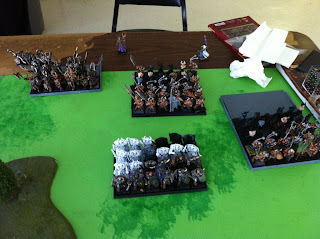 I was able to finish up and stay away from the Warriors the last turns. My Storm Vermin had wrapped behind the Warriors, threatening a rear charge and forcing him to play a reforming game rather than committing. This was able to keep them off my lines to finish out. My Plague Monks then rallied near my board edge saving me 300 points! The damn Chaos Trolls still held up my HPA and Slaves with the Maruaders in the flank and eventually my tropps there get wiped out, but not before I was able to 13th Spell the Chaos Warriors away, leaving the Chaos Lord and remaining L2 Tzeentch Sorcerer all by their lonesome to finish out the battle. 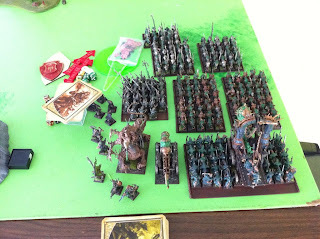 In the end it was a solid victory for the Skaven to open up the 2012 GLWL, and I chalked up the 2 points for the win (2 win, 1 draw, 0 loss). For qualifying for the season end tournament, total points scored are important, so I was happy with my 1909 points in the game. Skaven win 1909 - 517.